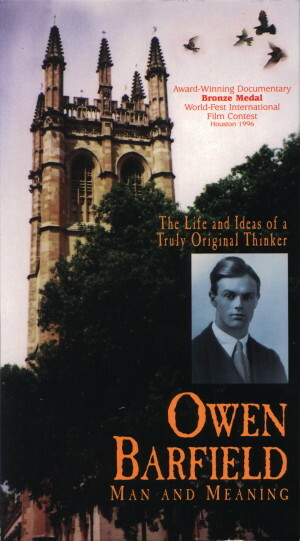 Early in the 1990s G. B. Tennyson and the Fetzer Institute began talking about the possibility of making a documentary on Owen Barfield, when Rob F. Lehman of Fetzer agreed to fund. Tennyson asked David Lavery, then at Memphis State University, to assist in the project. Ben Levin of the University of North Texas was asked to direct, and Wayne Derrick, an American cinematographer living in London, joined the project as camera man. Primary filming (done on Betamax) was conducted in Forest Row during the summer of 1992, with the students in a class Lavery was teaching in London that summer serving as crew. With continued funding from Fetzer and Tennyson's own generous financial support, Levin, Tennyson, and Lavery edited seven+ hours of raw footage during meetings at the University of North Texas during the next two years. 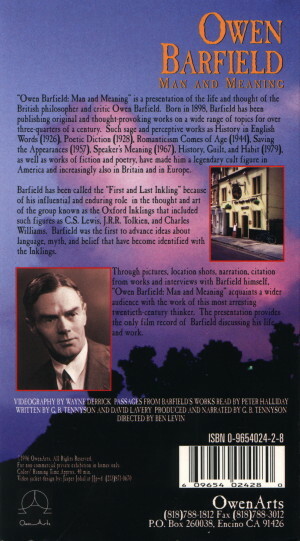 The end result was a 45 minute video entitled Owen Barfield: Man and Meaning. The film won two awards in competition. To read more about OBMM, go here. To read Dale Nelson's review of the video, go here.